Soda bread is a soft textured cake like bread that rises due to the reaction of the acid of a liquid like buttermilk, and a base like baking soda. 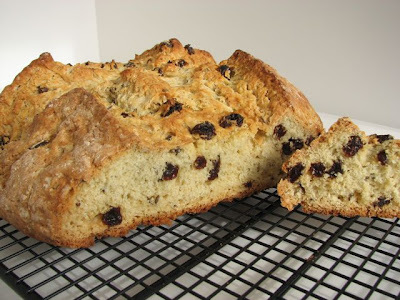 Although the Irish didn’t invent Soda Bread it is most often identified with them. The “soft wheat” is the only suitable flour that can grow in Ireland’s climate, and when mixed like a traditional dough it doesn’t form any gluten like a traditional yeast bread, it does work well with a soda bread recipe. The Idea of using soda to leaven bread was done by the American Indians centuries ago, where they used pearl-ash or Potash (a natural soda in wood ashes) in their breads to make them rise. The cross on the soda bread has several explanations, Legend has it that folks did it to “let the devil out” while it’s baking for good luck, and others say that it made it easy to divide into 4 pieces. It was also a symbol for a cross during Christian holidays. 1 Preheat oven to 425 degrees. Whisk together 4 cups of flour, the sugar, salt, and baking soda into a large mixing bowl. This entry was posted in Breads, Muffins. Bookmark the permalink.